UPDATE: The video of my speech is now available! The same techniques to master an audience this size can be used to keep the attention of your 3-person team. In either situation, you’ll have the same percentage of people distracted, tired or playing with their cell phones – you’ll also have the same potential to capture their interest and give them an experience that will stick in their minds long after you’ve finished speaking. 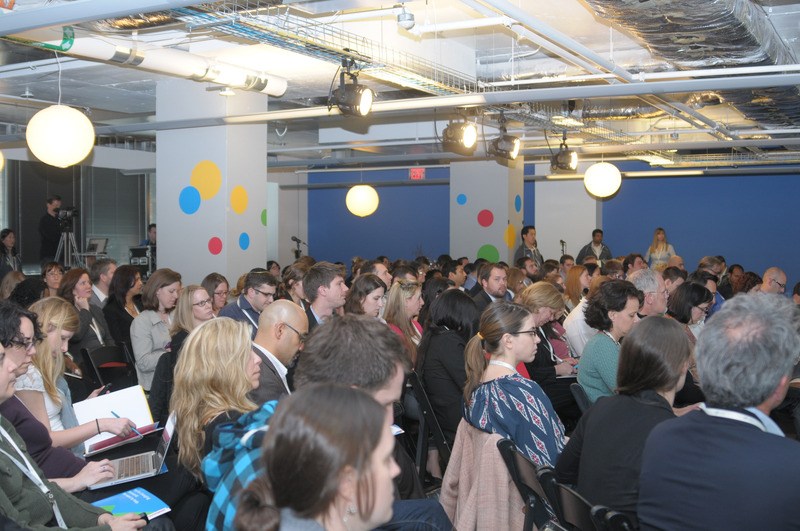 There are a million and one tips for public speaking out there – I will share the two that I found most useful for my experience speaking at the press event launch of Google for Nonprofits (G4NP) to a 200-person audience that I did not know. Put yourself in the moment: As with roller coasters, job interviews and skydiving, the anticipation is the worst (or best) part of public speaking. At the G4NP event, a series of engineering directors and nonprofit CEOs took the stage for over an hour as I stood backstage, feeling more and more like the butterflies were going to punch a hole in my stomach. I was in no shape to get up on the stage. The solution is to force your mind into the moment so you have no chance to dwell on your worries. There are many ways to do this, some people listen to music, others repeat tongue twisters, others play games – I look at pictures of cute animals online. Not only does this wipe worries from my mind, I end up taking the stage with a huge smile on my face. 2) Show don’t tell. Preferably pretty things. There’s a reason keynotes begin with high-budget video reels and why the massive screens behind Steve Jobs project images of the latest shiny product and not his face. The audience loves watching things, especially amazing things. 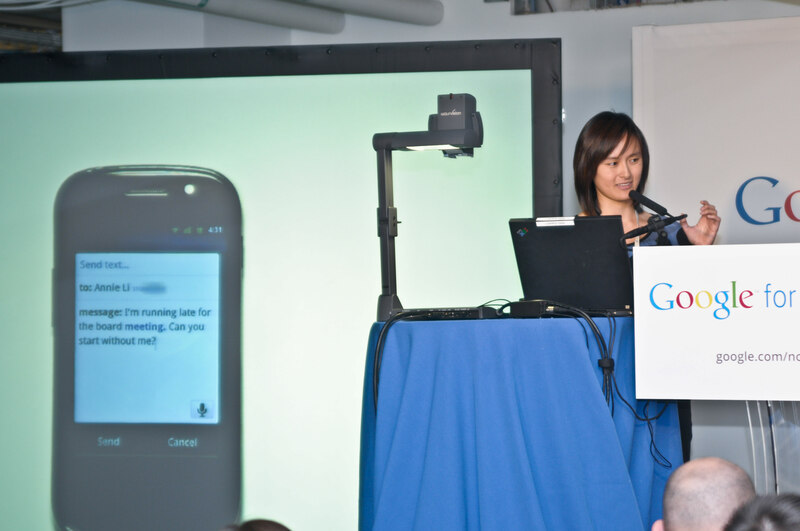 I was very fortunate to be giving a speech on mobile innovations – the topic is made for awe-inducing demos. In my 10-minute speech, I spoke for roughly 2 minutes and let the phone be the star of the other 8 minutes. I knew that I had succeeded when after I had composed this email simply by speaking, a woman got up from her seat to take a picture of the screen. Class dismissed. Now go conquer that fear! …in speech when I was psyching myself up to jump from 5.10d to 5.11a in rock climbing. It wasn’t work-related – but it was a clear case of generalizing when I could have chosen something much clearer and more specific. $5 has been earmarked for Room to Read. The last two I’ve highlighted in red as I overuse them in particular but were not included in the list. I’ve taken public speaking classes, am an active member of Toastmasters International and have taken at least one course in “Making it Stick“. Yet buzzwords persist in my language – Google is a corporation like any other in that we are equally victim to buzzwords. After reading this article, I searched through a day’s worth of e-mail for these buzzwords and found 5 occurrences. And this doesn’t even count how many times I use these words in speech, which has less of a mental filter than my typed e-mails. Short of audio-recording myself the entire time I’m in the office, I can’t hold myself accountable for all of the buzzwords I use in speech. But buzzwords in my e-mail I can do something about. MISSION: For every time I use one of the buzzwords above in an e-mail, I will donate $1 to Room to Read, a charity that works to improve education of children in developing countries. Let’s turn these buzzwords into the only good they will ever do. P.S. Yes, I scanned through this blog post before posting to make sure I hadn’t accidentally used a buzzword in it. Fortunately my buzzwords seem isolated to work conversations.